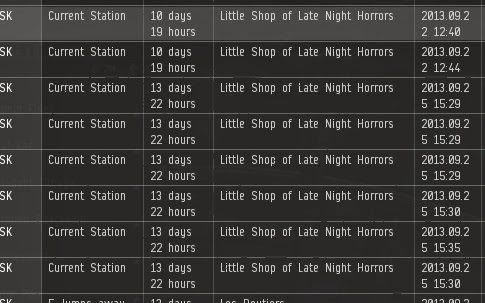 With Late Night deploying to nullsec, I had the passing thought of shutting down the alliance shop. At least temporarily. 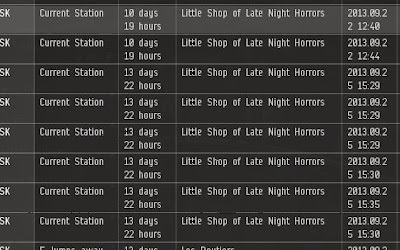 Fully fit ships in Huola would hardly be helpful when the majority of the alliance is dozens of jumps away out in null-sec, and the idea of moving the shop to null-sec gave me a throbbing headache. Instead, I decided to do the exact opposite, and expand. I've toyed with the idea of 'going public' before and even sold a few things publicly on a very limited basis. This, I guess, is as good a time as any to take the plunge and go all the way, making the 'shop' a fully public shop as opposed to merely an alliance convenience. I have a few misgivings. As an alliance shop, it was always easy for me to gauge what alliance mates wanted. I sat in coms, listened to all the theory crafting and more or less knew what the 'flavor of the month' would be and what would be in highest demand. However, I have the feeling that what was popular for LNA to fly might not necessarily be popular with the general Huola public. I will have to start at zero with figuring out that 'perfect' balance of being able to keep up with things that have a high demand, and not buying too much of something that's going to sit around and rot. Anyway, it should be interesting. Sugar Kyle has no compulsion about posting about her TCS adventures on her blog. I actually find it more interesting to read a blog where the author shows multiple play styles.